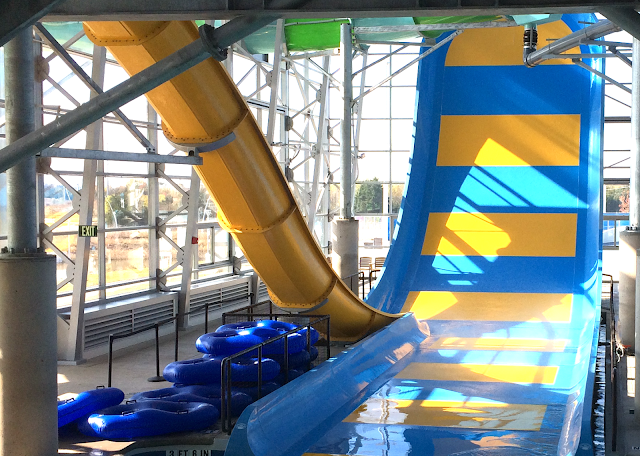 It's Summer Year-Round at Epic Waters in Grand Prairie! I've been complaining about the cold weather, but something EPIC just happened -- I found an 86-degree oasis in the Dallas/Fort Worth metro where it is summer year-round. This fabulous oasis is called Epic Waters and is located in Grand Prairie, TX. Epic Waters completely understands me -- this indoor waterpark is 86-degrees (right now - in November!) and includes a combination of energetic activities such as the Flow Rider where you get to boogie board on an everlasting wave and more relaxing activities such as a lazy river. There is something for everyone! Let me share an overview. I think that the term oasis is appropriate here, because the Epic Waters facility is the largest indoor waterpark under a single retractable roof in North America. During winter, the interior is climate-controlled. For instance, I learned that it was 86-degrees today. It hasn't even been opened for a full year yet, but the park has garnered accolades from the Travel Channel, USA Today, and the World Waterpark Association, as well as visitors from around Texas, across the nation and around the world. As a Boy Mom, I was excited to start Thanksgiving break with activities to promote physical activity. My children played hard and then came home and took a nap. It was sweet to see them exhausted from their fun day! Here are some of the fun water attractions. Let's start with the Rio Grand - a 600-foot lazy river which happens to be the longest indoor lazy river in Texas! My children went around the lazy river multiple times. It was fun to hear them exclaim, "Let's go around one more time!" 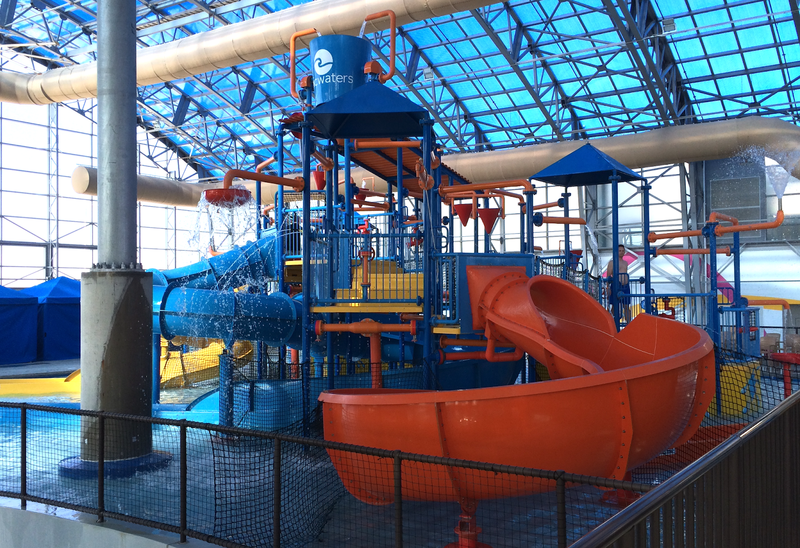 The Rascal's Round-Up is a children's area that is equipped with an aquatic fort, geysers, a giant tipping bucket, water guns, slides, and more. Racal's Round-Up rocked my toddlers little world! There are plenty of water slides for older kids and adults. Epic Waters offers three "first in industry" slides, including The LassoLoop, the Yellow jacket Drop, and the Aquanaut. Thrill seekers will have a blast! We had a blast (pun intended!) on the FlowRider® surfing simulator. It was a good workout and a lot of fun. We enjoyed lunch in our cabana. They have a variety of items at the Hungry Wave Cafe. For instance, our meals are shown below. We recommend ordering a few different meals and sharing with each other in order to enjoy the variety. There is also a full-serve bar - Longboards. Everything was delicious, but the pulled pork was my favorite. After lunch, we enjoyed the 45-game arcade. It was the perfect ending to our visit! While we visited as a family, Epic Waters is also available for birthday parties, church youth group events, overnight events, corporate events, and more. Holiday activities are planned throughout November and December - including a Breakfast with Santa and a family-friendly, all night New Year's Eve party! Now that I shared our highlights, let me share a few more details with important things that you will want to know before you visit. Epic Waters is located at: 2970 Epic Place/Grand Prairie/75062. You can find driving directions here. Nearby landmarks include a Restoration Hardware distribution facility and a police/fire facility. Epic Waters is owned by the City of Grand Prairie - learn more here. Parking is free: that's right - FREE! In fact, an enthusiastic employee drove us from our car to the facility in a golf cart. He also picked us up to return us to our car. It's free to borrow life jackets and inner tubes: parents are sure to appreciate that there aren't hidden fees! Cabanas are available for rent. We had a lovely cabana that overlooked the lazy river! Lockers are available to rent. They are a generous size. No hotel stay is required. Most indoor waterparks in Texas are at hotels and require you to stay overnight at the hotel in order to use the waterpark. Those of us North Texans who can't take the cold anymore are in luck because Epic Waters allows day pass visitors! They even sell season passes for locals. Of course, if you are from out-of-town, there are also nearby hotels. Let me conclude by telling you about EpicCentral. Epic Waters is only one part of a development known as EpicCentral Grand Prairie, which is also home to The Epic, a 120,000 square-foot fitness, arts and entertainment destination with programs and features for the whole family, including a million-dollar fitness facility, an interactive teen center, a theater (sponsored by Texas Trust), arts classrooms, a teaching kitchen outfitted by Ikea, private event areas and an outdoor concert space. It just opened, so you'll definitely want to check it out. They offer both day passes and annual passes.